The development of the resistance to used anti-infectives and the development of cross-resistant or multidrug-resistant strains are global problems. Scaffolds of (aza)naphthalenes and their simple one-ring analogues can be considered as privileged structures. These scaffolds can be easily and rapidly functionalized, which provides a possibility of a great number of targeted modifications as well as modification/optimization of physicochemical properties. This contribution is focused especially on the investigation of ring-substituted hydroxy(aza)naphthalenes and their one-ring analogues bearing amide and/or carbamate moieties that demonstrated promising effects against a number of human pathogens. Structure-activity relationships and the supposed mechanism of action are discussed. In addition, attention is paid to agents decreasing bacterial resistance, i.e. to agents that do not have sufficient intrinsic bacteriostatic or bactericidal activity, but in combination with clinically used antimicrobial drugs are able to restore the effect of these drugs or demonstrate synergistic antimicrobial properties together with the drugs. This study was supported by sanofi-aventis Pharma Slovakia. 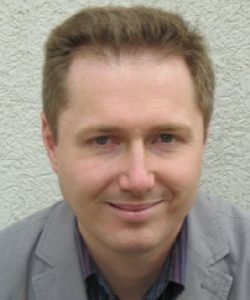 Josef Jampilek completed his Ph.D. degree in Medicinal Chemistry at the Faculty of Pharmacy of the Charles University (Czech Republic) in 2004. In 2004-2011, he worked in expert and managerial posts in the R&D Division of the pharmaceutical company Zentiva (Czech Republic). Prof. Jampilek deepened his professional knowledge at the Medicinal Chemistry Institute of the Heidelberg University (Germany) and at multiple specialized courses. In 2009, he became an Associate Professor of Medicinal Chemistry at the Faculty of Pharmacy of the University of Veterinary and Pharmaceutical Sciences Brno (Czech Republic). In 2017, he became a Full Professor of Medicinal Chemistry at the Faculty of Pharmacy of the Comenius University (Slovakia). He is an author/co-author of more than 30 patents/patent applications, more than 170 peer-reviewed scientific publications, 7 university textbooks, 20 chapters in monographs, and many invited lectures at international conferences and workshops. He also received several awards for his scientific results, e.g., from Aventis, Elsevier, Willey and Sanofi. The research interests of Prof. Jampilek include design, synthesis, and structure-activity relationships of heterocyclic compounds as anti-infectious and antiproliferative agents as well as photosynthesis inhibitors. He is also interested in ADME and drug bioavailability.